The relationship between a franchisor and a franchisee is a close partnership that does not start and end with the terms of the business model. Many other aspects have to be considered to forge a successful partnership that can weather the various storms that may come along the way. The Accelerator Program facilitates the road to operational excellence for all stakeholders like brand teams, entrepreneurs and senior management professionals by helping them gain insights intoleveraging the power of franchising for fast paced growth of their businesses. 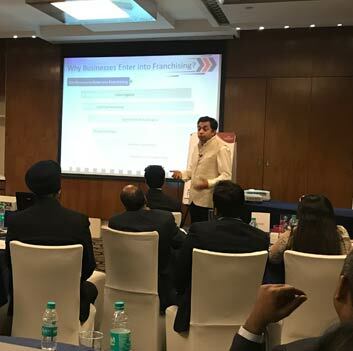 The program, designed by various domain experts, helps the attendees understand the fundamentals of franchising in a concise and practical manner, aims at explaining the process of franchising, one step at a time. 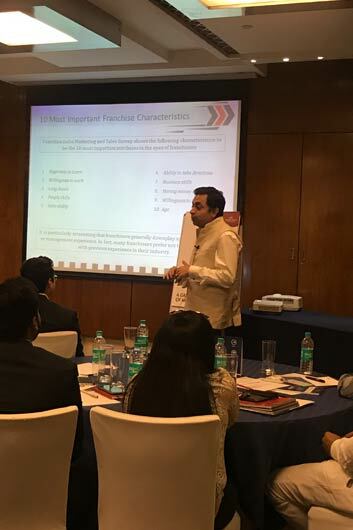 After a comprehensive session like this, the attendees should be able to envision how franchising can be adopted as a tool to create a wider outreach. 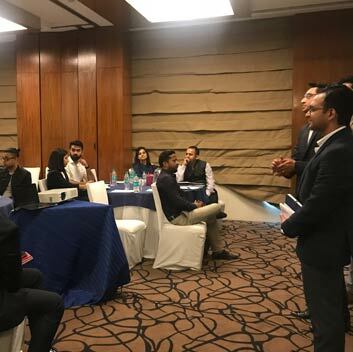 The program is crafted to cater to C-suite executives like CEOs, COOs, CMOs, directors and proprietors, in strategic decision making positions for brands from all sectors including, retail, F&B, hospitality, education, apparel and textiles, wellness and healthcare, consumer good, E-commerce and many more. Contact Us to arrange a call back for free consultation on how the Accelerator Program can benefit you and your organisation. Read up some of our work here to understand the current industry scenario. Anchored to the prestige, profile or authenticity of the original brand, a sub-brand is beneficial for creating exposure to a specific customer segment that got skipped from being engaged. A sub-brand’s creation leads to evaluation of the value of the parent brand while tapping into new markets is easily attained due to a greater sense of brand loyalty while taking advantage of the trust built from the larger brand or company. With this mastermind plan, many footwear companies like Woodland, Liberty, M&B and the likes have entered the market with their prodigies to help attain a wider reach. Being a mono-brand company from 1982-1991, Liberty quickly realised that the TG and aspirations of the expanding customers was very different from product offerings. To cater to the individual identity of each collection, Liberty thought of connecting each brand with a particular mood. With this idea, it launched its prodigy, Healer, into the footwear market. "The moment you create a sub-brand, you are able to communicate differently and create an aura around the sub-brand, which helps you to further strengthen the category and connect with the consumer. 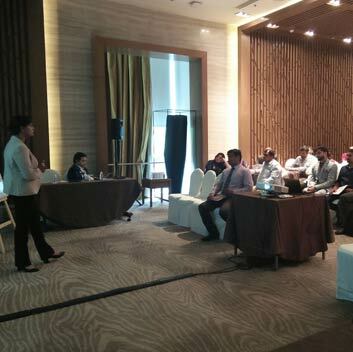 This helps to sell multiple pairs,” shares Anupam Bansal, Executive Director, Liberty Group. Observing growth in the luxury market with a rise in demand for premium products, Woodland, long known for being the adventure gear-makers, launched a parallel brand by the name WOODS to cater to formal and semi-casual footwear, apparel and accessories. "With WOODS we created an opportunity to build and sustain our relationship with a new segment of consumers under the aero club," informs Harkirat Singh, Managing Director, Woodland. "The major advantage of having a parallel brand is that you can cater to formal and semi-casual footwear, apparel and accessories. "With WOODS we created an opportunity to build and sustain our relationship with a new segment of consumers under the aero club,” informs Harkirat Singh, Managing Director, Woodland. "The major advantage of having a parallel brand is that you can cater to different segments and categories," he adds. McDonald's and Domino's were the first brands to set up a global market trend in India in 1990s, subsequently inviting many international brands to the country. However, with the same replica model, strategy and product portfolio, many of them are struggling in the Indian market even after spending 5-7 years. For instance, Papa John's is already out of India, closing its door in the country. The reason: it failed to meet its store level EBITDA for more than a year, focusing more on brand-building. Also, there’s news brewing that the promoters of Barbeque Nation, which has bought the master franchise rights for American burger chain Johnny Rockets in 2016 to replicate their casual dining model, are unhappy with the performance of the brand. Likewise, JSM, which owned Hard Rock, California Pizza Kitchen and Shiro, has struggled in the recent past. And the buzz is that it has sold a majority of the stake to property developer Jitu Virwani, who now owns around 62% in the company, along with Sanjay Mahtani, one of the co-founders, as well as some other investors. Taking into account all such true but unconfirmed stories, the question still remains the same: why do these brands fail despite of the fact that they were running on the same model which made brands like Domino’s, McDonald’s, Pizza Hut and KFC flourish in the Indian market? From the first store in 1996 in Mumbai to 265 stores across South and West India in 2017, McDonald’s has indeed arrived a long way with immense learning and evolving as regards its customers. “The key to our success is the fact that we became locally relevant to the people in India,” points out Amit Jatia, who introduced McAloo Tikki to Dosa Masala Brioche to Chatpata Naan – Indianising them to stay ahead of the curve. Similarly, with more than 400 stores operational in India, Pizza Hut knows how to keep customers happy by maintaining quality food and value-for-money pricing. “We are the first brand to engage with consumers by way of signature writings on the bills – our servers write down personal experiences they have had with the customers on bills,” shares Unnat Varma, Managing Director, Pizza Hut India Subcontinent. And, this gives an answer to many unsolved mysteries of the brands who are trying to get Indian customers on their platter; they are lagging behind in customer satisfaction. Though, they have replicated the model of the top brands they couldn’t sail through because of their product line (too much to offer with no signature product) and mistaken concepts, thereby unable to drive customers to their outlets. Over 650 QSR and cafe outlets shut down between 2013 and 2016 in India, according to a study done by Tag-Taste, an online community for food professionals. The sombre mood of the restaurant industry is reflected with the results that these brands are facing. Reckless expansion, no product standardization, management conflict and undefined territory and audience are a few learning lessons for brands that are venturing into the Indian market soon. Once eyeing product licensing, the fraternity has devised Licensing 2.0 to address the new-age consumers who are increasingly redefining their values and priorities. This phenomenon is steering a gradual progression, especially in sports and music licensing along with theme parks or themed travel. This trend also puts forth a plethora of opportunities across a wide range of industries, including, travel, apparel and footwear, toys and games, consumer electronics, and personal accessories. Given the redefined values and priorities amongst consumers, coupled with time becoming a luxury, ‘new consumerism’ has taken shape that finds its roots in the experience. This trend is impacting across many areas while consumers increasingly seek to ‘do something different’, searching for unique, often personalized experiences. Globally, sports licensing has registered steady 5% year-on-year growth in the last few years, driven largely by licensed sports apparel merchandise sales. In India, licensed sports merchandise worth USD 18 million was sold in 2016. Majorly driven by sports leagues and cricket, this genre is witnessing emergence of concepts like sports academy, which focus on experience, and thus better engagement. Millennials account for a sizeable demographic and this key consumer segment for licensing businesses has comparatively a huge penchant for travel. The millennials’ group is projected to record the fastest growth in world travellers with a forecasted increase by 69.7 million over 2015-2020. Theme parks themselves have become an increasingly important component of many brand licensing strategies in recent years, as licensors search for innovative ways to leverage their property, enhance brand awareness and connect with fans. “The amusement park business volume is estimated to be around Rs 3,000 crore with a growth rate of 10% year-on-year. Hence, there is huge scope for large licensors to exploit this market. The kids and youth population is growing in India; hence organized ventures into the amusement business would be an excellent avenue for business,” opines Samir Jain, COO and Executive Director, Green Gold Animations. The worldwide sales of theme parks stood at USD 30.9 billion in 2015, registering a 1.6% drop as compared to the previous year. However, steady growth is expected as the category is projected to record a value CAGR of 10% over 2015-2020, making it the second most dynamic behind national parks in overall attractions. And here, innovations count. For instance, Warner Bros. Studio Tour London – The Making of Harry Potter has announced that it will hold a romantic dinner in the Great Hall of Hogwarts School of Witchcraft and Wizardry. Similarly, HBO Nordic has teamed up with Lapland Hotels Snow Village in Finland to construct a ‘Game of Thrones’ themed hotel made out of only snow and ice. Within the hotel one could find a number of Game of Thrones features like the Hall of Faces, giant ice dragon sculptures and even an iron throne made of ice. Disney has also announced a host of new attractions at Disneyland Resorts in 2018, including a Pixar-themed celebration. Also opening in 2018 is ‘Pixar Pier’, a new land in Disney California Adventure featuring four whimsical neighborhoods based on Pixar properties. Apparel and accessories, footwear, videogames, consumer electronics (headphones/earphones, wireless speakers), toys and games, personal accessories, home and garden are some of the major industries and categories that would benefit further from experiential licensing. Over the past few years, the retail sector in India has undergone a tremendous change with the advent of smartphone, increasing urbanisation and growing per capita income. This has prompted the traditionally unorganized Indian retail sector to move towards online and organized retail. The customer today is more aware of his or her needs, is brand aware, and shops for the preferred brand through multiple mediums. In the next five years, organized retail in India is expected to grow at a CAGR of 32%, which is four times more than the pace at which the overall Indian retail market is expected to grow. And online retail is expected to grow at a whopping rate of 63%, although it has a low base. In the current environment, it is imperative for retailers to not just be present in one medium but offer a holistic experience to their customers. It is the right time for Indian retailers to adopt omnichannel strategies – such as Click-n-Collect – and implement them on a large scale to reap their return on investment (ROI) benefits. Multi-brand outlets like Lifestyle have started offering services supporting their online platform – ‘purchase online and collect offline at the stores’. This concept not just helps increase revenues from the online medium, which is increasingly becoming a much popular shopping medium, but also ensures effective payment queue management during a busy discount season. Also, in online retail, fulfillment cost, i.e. cost associated with packaging, shipping and delivering product to customer, is very high (15-25% of the revenues) and is a major reason why none of the e-commerce players are able to achieve positive operating margins; fulfillment cost will dramatically reduce if you persuade your customers to buy online but collect in person from a store. The added bonus of this approach is that the basket size often increases, as customers purchase additional items when collecting their order-in-store. Retailers have also started to explore certain new concepts as well, such as ‘Endless Aisle’. Adidas, Reebok and Max have recently equipped their stores with iPads under the aegis of this new technology so that shoppers can browse and order for items that are not in stock at the physical stores. 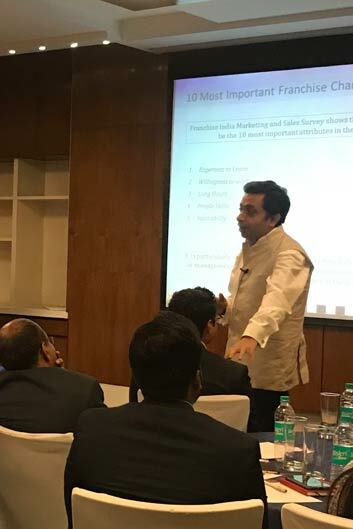 In conclusion, one may say that omnichannel strategy offers a win-win situation for both customers and the franchisee retailers in the market. Also, small town population looks for something they can relate to or something they can look up to and brands need to keep this in mind while expanding in these areas. Having known and loved celebrities as the face of the brand helps immensely here. “AND, for instance, has Kareena Kapoor as our brand ambassador and that itself is quite a big pull as she is a face which is very familiar with Tier II and Tier III markets,” says Bijit Nair. While we talk about smaller markets giving importance to branded fashion and lifestyle, what exactly has made this possible? As Neha Shah rightly says, “People in smaller towns are as aware of current trends and styles as people living in the metros. With technology advancements and rapid expansion, these factors together blur the lines in consumer psyche or behaviour in both metros and small towns.” And so, offering the latest global trends for the fashion-conscious populace is the right step forward. So What Makes For A Successful Franchisor-franchisee Bond? In this fast-paced world, trends change every day and people tend to develop a new taste every second. Not everyone can take a sip from the cup of the same franchisers, which makes franchisors’ task extremely difficult. In order to keep their status certain in the market, franchisors break the monotony with intensive research and study to keep their grip and hold firm in the eyes of the customers. In a nutshell, renowned franchisors from across the globe have come to a conclusion that the key to prepare a successful franchisee is proper research in ideation, training, audits, key account management allocation, etc. Rules and regulations tend to change in any country and so the franchisors need to keep an eagle eye on the progressions, documentations and other formalities post signing an accord with their franchisees. Established brands make sure they undertake rigorous measures and agreements before signing a deal. For instance, Subway starts its communication by sending a Franchise Disclosure Document (FDD) first. The area of an outlet only adds to the brand’s image. Franchising heads choose the location as per their target audience and whether it is in malls, shopping centers, or near cinema halls, they have to be very selective and wise. “The factors we research before joining hands with a franchisee are the potential customer base, traffic patterns, proximity to strong population back-ups, visibility, and parking,” Rana states. Moreover, a franchisor prefers to keep its franchisees under close connection. “A location should have a nearby business and residential community,” says Rana. With the changing trends, laws, time and consumer feedback, the franchising model has to be flexible so that the brand can skip the repercussions. The Italian mobile repairing company Phonup considers India as a vast and diversified country. “Hence, in our view, FOFO (franchisee owned franchisee operated) is the recommended model,” says Amit, Chief Operating Officer, Phonup. A number of franchisors including Kioda have decided to enter the market with an investment model. “We will be retailing in multiple categories in our stores,” says Karthikeyan Vishnu, COO, Kioda. If there is a loophole in the quality of the product, all fingers will be raised towards the parent company; therefore, they have to make a timely check on certain things. If it is a restaurant franchisee, then the food quality, surroundings, hygiene, etc. need to be inspected frequently. For example, Subway assures that it keeps on innovating and improving with the surroundings of its restaurants chains. Franchisors and franchisees share a very fragile relationship which needs to be enriched by healthy communication for mutual trust and confidence. If there are healthy negotiations, then the franchising brand can rise up through thick and thin. “We consider our franchisee as a ‘partner in progress’. We believe that a long-term relationship is built on mutual trust and support. 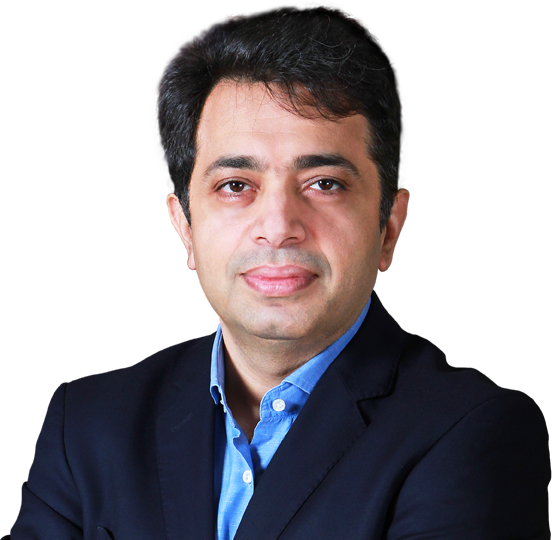 The journey to such a relationship starts from a stringent franchisee and vendor selection process, 360-degree guidance and support during set-up, marketing, operations, product assortment, customer care, and repairs,” says Amit. With the Indian retail industry warming up to omni-channel retail and major players geared up to revolutionizing customers' journey at every possible channel - the age of diction is right here. India’s retail market is expected to grow to US$ 1.1 trillion by 2020 on the back of income growth, urbanization and attitudinal shifts. The organized retail sector which is estimated to reach approx. 18-20% of the total sector, by 2020, is growing at a high rate of 20%-25% p.a. There is a potential of targeting an organized market of US$ 70-US$80 billion currently, which comprises organised Indian and international retailers who are operating in India or are evaluating entering India. The future of the retail sector in India seems to be exciting as both organized and unorganized retailers and it seems reasonable to assume that an exciting year lies ahead for the retail sector. Are you ready to challenge it? If you ask yourself why a business would suffer just because demonetisation happened, you will realise that it was not a problem of cash but a problem of business. The business was not right and was designed in a way that we went on reducing the prices of all the goods. Be it a diamond manufacturer or an apparel manufacturer, each went on reducing the cost so much so that his only source of income was then his savings. Whatever was left as his savings was his income. So there was no net profit and no business as such. When China started manufacturing it realised at a very early stage that it had to start supplying to the world at large. The Chinese government has also been very conscious of the fact that there would be forces from around the world that would try to hack this rapid manufacturing momentum. As expected, India’s Prime Minister Narendra Modi came up with ‘Make in India’, US’ President Donald Trump came up with ‘Make in America’, and so forth. Sensing this, the Chinese government has put a trillion dollar fund to create Chinese brands. The result is that you can find Vivo and Oppo posters all over the country and the same is the condition worldwide. This is because they are investing in building brands. The message here is that if you do not invest in creating a brand, sooner or later you will be out of business since remaining a job work company will not take you through. The moral of the story is: you should always concentrate on building a brand even if you are a manufacturer so that everyone gets to know what you stand for. A large number of SMEs suffer because of lack of capitalization. The unavailability of capital is a major obstacle in the growth of businesses in India or if it is available, it is unaffordable. As a result, many SMEs remain undercapitalized. Seasoned businesses are somehow reluctant to ask for money or approach private equity or angel investors despite having a sound business model. The truth is that the capital is available more for mature businesses but people are under the impression that a startup can get money but not them. It is a mindset issue because thinking has been moulded in that way. A business can only thrive if it continues to grow. It can’t remain stagnant and growth is only ensured through spotting a niche or a new market through a new innovative product and through a new channel of selling your product or service. Entrepreneurs, therefore, need to push their journey from being in the business to being on the business in order to grow. All our lives we build an income-driven business but fail to build the value of our enterprise. A proprietary product or a market share or your brand….anything which resonates well with your identity is the only way to build the value of the enterprise. Creating a winner product or winner service is essential to the growth of the business. And knowing when to shift is another factor that aids growth and diversity. It is advisable to shift when one is at the peak instead of the other way round. Building on quality franchisee: Finding the investor with the 'right intent' is critical to ensure long-term growth. When it comes to the education sphere, franchising has certainly emerged as the most successful model for geographical expansion. And it is gaining maximum traction in the preschool segment. So much so that the preschool industry has grown to USD 3.24 billion and branded preschools are contributing about Rs 45,000 crore. However, there still exists a huge gap between the scenarios of supply and demand of quality preschools, which presents a great opportunity for entrepreneurs. "Currently, the branded preschool market hardly commands a share of 28-30% and there is huge scope which needs to be explored,” believes Dharmesh Kapasi, Founder and President, Shanti Juniors. Today, even preschools have two set of customers to satisfy – parents and children. And with modern-day preschool franchises offering unique facilities for overall development of the child, they are able to command a good franchise fee and equally better school fees. “Ideally most parents look for holistic development of the child and therefore academics become a primary feature. In addition, extracurricular activities, safety and hygiene are important parameters for taking a decision,” says Kapasi. In that sense, branded preschools have set infrastructure, structured curriculum, well-planned activities, etc. As former President Pranab Mukherjee once said, "We often boast about India’s demographic dividend. But the question that arises is what do we do with this if we cannot skill them, if we cannot educate them and cannot enhance their employability." As such, skill training has come to occupy a paramount position in the Indian industry and via franchisees the ISSUE FOCUS SKILL DEVELOPMENT biggest of the brands are taking their businesses to new heights. The Indian education sector has witnessed a rapid growth in the number of institutions and students over the last few decades. And in today’s world of globalisation, skill training is an integral component of increasing efficiency and productivity for the healthy economic development of any economy. And even though the trend has only recently started taking a concrete shape in India, the increasing demand for skilled manpower is providing a new direction to players involved in building or reengineering the skill ecosystem. One of the pioneers in this segment has been NIIT that flagged off the franchising model in IT education in 1986 by delivering high-quality, cutting-edge, standardized technology learning through a robust franchisee network. "The distributed education model with integrated process management aspects is what makes NIIT's franchising model stand out uniquely," says Prakash Menon, President-Global Retail Business, NIIT. Operating on similar lines has been the Institute of Computer Accountants (ICA), a skill development institution that has built up impressive brand value over the past 18 years. Mall developers across the country have found a new mantra to attract or retain tenants by taking up brand franchises themselves. Consider this: Tablez India has taken master franchising for brands like Toys R Us and Babies R Us. "It is a good practice because sometimes the brands are not very keen to come to Tier II and III cities. If the mall is confident about the property and can run the business well, then it certainly is a good concept," says Shibu Philips, Business Head, Lulu Mall. Franchising has created long-term opportunities for real estate developers. “In the initial phase the shopping centers are very expensive as it costs about Rs 15,000 - 20,000 per sq. feet but if one is buying the property and putting it up on a lease then it’s profitable as the revenue could be around 10-12%,” says Munish Baldev, founder of retail consultancy J S Martin. Among others, the food and beverage category is gaining huge momentum through using the franchising. 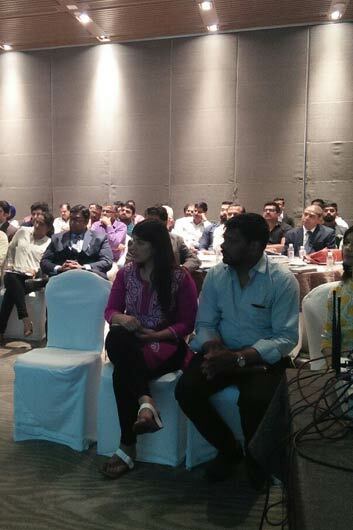 Yogeshwar Sharma, ED & CEO, Select CITYWALK, shares,"We are already taking on the franchise model. As a shopping centre, to offer a variety of brands to our shoppers is a winwin situation for both the retailer partners as well as for us. As a business partners route, it also helps us to work closely with the brands." Win-Win Situation The franchising model is beneficial because it gives a developer the opportunity to revive the mall and ensure occupancy. "It's beneficial for both the developer and the brand with the latter getting the advantage of expansion with minimal risk involved while the developer has the liberty to select a brand, define the brand mix and position the mall right," believes Pushpa Bector, EVP and Head, DLF Shopping Malls. Echoing similar views, Sharma says, "Retailers' occupancy cost comes down and the revenue share component goes up. For developers, they have control over the managing again, depending upon the business arrangements." "The concept of franchising is the only way to go forward because franchisees are doubling up the revenues of developers and providing them new opportunities to grow across the nation. India has 526 districts and a single developer can’t look after each and everything all alone. Therefore, these franchisees are helping developers to bridge the gap in between," says Baldev. A host of global players including Wall Street English, Sherpa Kids, Little Kickers, Kumon, among others, are set to have a big pie of the Indian education market. A world leader in adult English education, Wall Street English is eying cities like Delhi and Mumbai for setting up its centres here. "Any big urban hub with a lot of industries and business is a good place to start," says Lex Baker, Franchise Management and Development Director, Wall Street English International. Interestingly, there are many English speaking institutes offering spoken English courses in India and yet Baker believes the blended learning concept of Wall Street International is what sets them apart from competitors. Japan-based Kumon is another player in the race. It offers after- INTERNATIONAL GOING GLOBAL school math and reading program for kids and is planning to expand further. It already has its branches in Mumbai, Bangalore, Kolkata and Delhi. "The Kumon method is an individualized learning method. Students start with the level where they can attain a perfect score by studying on their own. If students continue to study at their own pace, they will catch up with their school grade level and eventually advance far beyond it," believes Takaya Kitanishi, MD, Kumon India and Sri Lanka. Playing and Learning Canada-based Little Kickers uses soccer-based programmes to help in the early development of the child. Christine Stanschus, founder and CEO, Little Kickers, says, "India is a slightly different market for us. It is not very well-developed in terms of the edutainment offering to children when compared to its global counterparts and there exists an untapped potential." After tasting success globally, she has decided to enter India and recently launched franchises in Mumbai and Gurgaon. Besides, New-Zealand- based Sherpa Kids is planning to introduce the new concept of ‘out of school care’ provider in India which allows parents to leave children after schooltime and engage them in activities customized to fit in with the requirement of their studies. Dawn Engelbrecht, MD, Sherpa Kids International, says, “Education provides a booming opportunity and there is a huge change happening in India. The number of students taking up vocational training has been on a rise. There are physical centres providing skill-based training to students as well as online portals providing classes for specific courses which may vary from two to six months. Such courses are taken up by postgraduate as well as high school pass students to enable them to gain a new skillset or improvise their limited knowledge to change domains. Organisations have come to realise the power of big data and analytics with the kind of efficiencies that can be achieved through this. Such courses have not yet been fully introduced in all formal education institutes; hence, organisations are taking advantage and filling the gap by providing such courses through offline and online self-paced mode. Schools and institutions both are leveraging the online e-based learning technology to aid their face-toface interaction with students by providing them live examples and simulations through online classes and virtual reality headgears. Additionally, online test series, group discussions and seminars are conducted through the online mode. There are organisations aiding schools in development of the creative side of the brain for students. They associate with schools and conduct workshops which help in creative development of the students. This has become extremely popular among parents as people nowadays understand the importance of overcoming the monotony which children suffer from. Over the past few years, major international brands have been focusing on the Indian market for expansion through franchising. In addition, domestic businesses have been modernizing rapidly, and franchising has become increasingly popular across the country as a business expansion method. Franchising is a unique business model with the franchisor’s intellectual property at its core. Intellectual property can include trademarks, copyrights, trade secrets, trade dress (i.e. the look, feel and distinctive elements of a franchise system such as the interior design, layout and other visual aspects of a franchise location), patents and the trade names under which franchise businesses operate. Every franchise relationship is built on the value of intellectual property (IP) assets. Franchisees purchase a license to use a franchisor’s IP, including trademarks, confidential knowhow and in some cases, By Arjita Bhalla (Advocate), Partner, License India Advisory LLP even processes and methods, because of the goodwill and reputation that a franchisor’s brand has accrued with consumers in the market. A franchisor only grants to a franchisee, from the effective date during the term of the franchise agreement, a non-exclusive, non-transferable license to use the IPR solely as is necessary as per the scope of the franchise agreement entered between the two parties, and not for any other purpose whatsoever. Maintaining Exclusivity A franchisor reserves the right to use any and all skills, expertise, knowledge and knowhow in the provision of similar services to other franchisees and/or potential franchisees and a franchisee shall place no restriction whatsoever on such rights. Before commencing a franchising relationship, a prospective franchisor must ensure that all the relevant intellectual property associated with the business is adequately protected. If the IP is not protected, competitors may be able to use the franchisor’s intellectual property. This is the case if the intellectual property of the franchisor is generic or not sufficiently distinctive. These rights also need to be of continued use in the country of origin and the franchisor needs to have a policy of taking action against anyone who uses such property without permission. It is very important for all of the franchise’s intellectual property to be protected both by legal means and by the franchise agreement between the franchisee and franchisor. A franchisor being a lawful owner of its trademark can protect the same by taking legal course through infringement suit before any court of law and also by contesting opposition proceedings before the Registrar of Trademarks. One should keep an eye on competitors copying the trademark, which can adversely affect the reputation and long lasting goodwill of the brand owner. When it comes to branded merchandise associated with movies, Indian producers have not been able to gain much traction as compared to Hollywood studios.